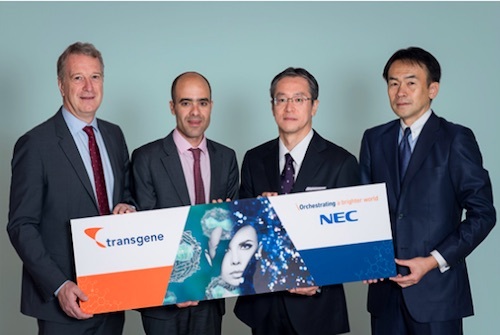 TOKYO, Oct 30, 2018 - (JCN Newswire) - NEC Corporation (TSE: 6701) and Transgene today announced the signing of a Memorandum of Understanding (MOU) for a strategic collaboration aimed at the treatment of solid cancers. The companies will cooperate in clinically assessing the predictive capabilities of NEC's artificial intelligence (AI) and the therapeutic potential of Transgene's myvac(1) MVA-based viral vector platform in an individualized immunotherapy for the treatment of solid cancers. The experimental products from this collaboration are expected to enter clinical trials in 2019. Immunotherapy is rapidly becoming the treatment of choice to fight cancer as it activates the patient's own immune system to attack cancer cells. NEC and Transgene have capitalized on the recent progress in AI and advances in genome sequencing to create individualized immunotherapy, which is adapted to the unique characteristics of each patient's mutational landscape as well as their predicted immune responses. The product is based on a viral vector (MVA) developed by Transgene with a proven clinical safety track record and is known for its efficient immunogenicity and anti-tumor efficacy in patients. The viral vector will be used to target neoantigens identified using NEC's proprietary algorithm. NEC has been developing solutions in the drug discovery field for close to two decades. NEC's neoantigen prediction system(2) was developed and validated based on publicly available databases, as well as internal wet lab datasets, some of which were already used to identify clinically relevant antigens in other oncology indications. NEC's cutting-edge AI technology, "NEC the WISE"(3), for identifying and prioritizing patient-specific neoantigens, and Transgene's unrivaled MVA-based, viral vector technology and the myvac platform. "The emerging personalized medicine field holds great potential for the application of NEC's core technology, and we are pleased to be working with Transgene with the goal of developing state-of-the-art personalized immunotherapies," said Motoo Nishihara, Senior Vice President, Head of NEC Laboratories. "Engaging the body's own immune system in the fight against cancer has shown great promise and sparked unprecedented interest among oncology drug makers. This makes it imperative for NEC to become part of the immunotherapy race as soon as possible," said Osamu Fujikawa, Senior Vice President, Business Innovation Unit, NEC Corporation. "This collaboration brings together artificial intelligence and our expertise in viral vector engineering to enable the development of a truly innovative treatment based on the myvac platform. We believe that our collaboration with NEC will allow us to provide an efficacious and robust therapy for the many patients who have solid tumors and could benefit from this cutting-edge individualized approach, and to successfully advance the development of the myvac platform to the market" said Eric Quemeneur, Pharm.D., Ph.D., Executive VP, Chief Scientific Officer of Transgene. myvac is a viral vector (MVA) based, individualized immunotherapy platform that has been developed by Transgene to target solid tumors. The myvac-derived products are designed to stimulate the patient's immune system, recognize and destroy tumors using the patient's own cancer specific genetic mutations. Transgene has set up an innovative network that combines bioengineering, digital transformation, established vectorization know-how and unique manufacturing capabilities. NEC's neoantigen prediction utilizes its proprietary AI, such as graph-based relational learning, which is combined with other sources of data to discover candidate neoantigen targets. NEC comprehensively evaluates the candidate neoantigens with a primary focus placed on its in-house MHC-binding affinity prediction. These allow NEC to effectively prioritize the numerous candidate neoantigens identified in a single patient. NEC the WISE is a term for the Company's cutting-edge portfolio of AI technologies.